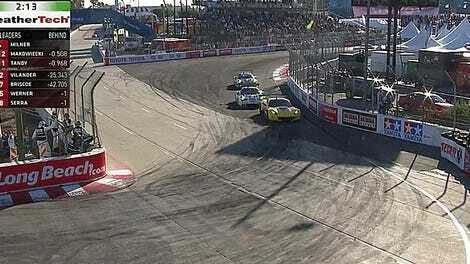 The Long Beach Grand Prix street circuit is infamously tight in some spots, and always a solid bet for insanity. Today’s WeatherTech Sports Car Championship race at Long Beach only made it to turn six of its first lap before a dumb little pile-up that caught several of the top qualifiers in the GTLM class out. Toni Vilander in the No. 62 Risi Competizione Ferrari 488 GTE made contact with the rear of Ed Brown’s No. 22 Tequila Patron ESM Prototype, as Vilander tried to pass on the inside, spinning Brown’s Prototype around in the process. Vilander had jumped to the front of the GTLM class early in the multi-class WTSC race. The No. 66 Ford GT of Joey Hand, which had qualified in second place, rear-ended Vilander in the spin-cident. The GTLM pole-sitting No. 3 Corvette was also held up by the mess, causing an immediate shake-up in the class standings. Fortunately, all drivers were OK following the incident, although the No. 22 and No. 62 have been retired. Officials took no action on the incident. The No. 66 Ford, however, was able to continue with a big chunk out of its nose. This is a race! Ain’t nobody have time to look pretty. Weirdly, we weren’t able to see this on its regularly scheduled channel. Because the NASCAR Xfinity race went overtime, its ending preempted the start of the WTSC race, pushing WTSC to Fox Sports Go online. Um, guys? You’re basically the kissing cousins of motorsports. Your headquarters are the same building, for Pete’s sake. How was there not a little more buffer time scheduled in there? Either way, the broadcast is now on its originally scheduled channel now. Expect many, many little incidents like this one all weekend long, with close walls and lots of racer-thirst making it one of the most insane race weekends of the year. Long Beach! I’m pretty sure if you look up “chaos” in the dictionary, you’re just going to see an outline of this street circuit.